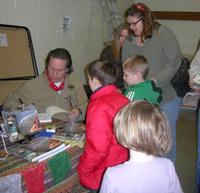 We had a wonderful crowd at the Sorensen Public Library in Omaha Saturday evening. Over 80 people dared the weather, some from as far as Columbus, to listen to the stories and see the images from the Wondrous Journey. Many thanks to the friends of the library for sponsoring my afternoon. I love going to Omaha, I should visit the library sometime too. - Brittany, Fremont Middle School student. Omaha is so close to here. I go there a lot, but I dont know were the library is though. I can't wait untill you start your trip in March starts! I hope you figure out how to use a Podcast, I would probably mess one up!